Lights out! You want maximum spookiness so you as if you're trapped in the house with the heroes. If you do this, the film won't lose much to the small screen. 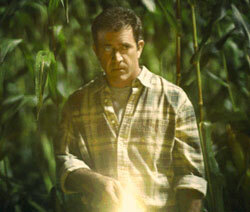 The house in question belongs to Graham Hess (Mel Gibson) a Bucks County, Pa., farmer and former preacher who hung up his collar after losing his wife to a car crash and losing his faith as a result. He now lives a quiet life tinged by heartache in his modest, two-story farm house surrounded by his two loving children (Rory Culkin and Abigail Breslin), his younger brother Merrill (Joaquin Phoenix) -- a washed-up bush league baseball hero -- and his cornfields, which soon become a source of engulfing apprehension and mystery. A bright glow behind the barn one night lead Graham and Merrill to discover huge swaths of corn flattened into a colossal, complex geometric design -- the kind of "crop circles" that baffled scientists and pundits for years until hoaxers confessed to a simple system of stomping down crops with a wooden board. The film quickly dismisses this explanation for the circles in Graham's corn -- the crop is too sturdy and too tall (hoax circles were in grassy crops) and bent over but not broken. Graham isn't willing to embrace any extraterrestrial explanation until a television report reveals similar and even more startling events worldwide that seem to have even the news anchors spooked. Suddenly the TV stations go off the air; eerie, encroaching noises begin coming over the wireless baby monitor Graham's son had been playing with as a walkie-talkie, and Graham himself chases several somethings with pasty blue-green legs through the corn. Invoking the originally spine-tingling spirit of 1950s and '60s sci-fi B-movies, but updating it to defeat the savvier apathy of modern audiences, "Signs" becomes gripping once Graham and Merrill begin boarding up and fortifying the house in the hopes that these seemingly insignificant efforts might somehow spare them from whatever is going on Out There. Shyamalan borrows from Alfred Hitchcock's "The Birds" for a scene in which the Hess family is huddled in the sealed-up house while frightful noises come from every direction. The clickity-clack of some kind of footsteps on the veranda and pounding thuds from the roof -- and then from the upstairs bedrooms -- soon drive Graham and clan into the cellar where they barricade themselves in as best they can, then listen in trepidation while bathed only in the light of two flashlights. While the film's score (by frequent Shyamalan collaborator James Newton Howard) ingeniously combines homages to Bernard Herrmann's themes for "Psycho" and John Williams' music for "E.T.," in these scenes Shyamalan employs no score, letting the exterior sounds and actors' strong performances work the audience's anxiety. Gibson's gift for playing dedicated fathers and troubled souls is put to good use in these scenes as he calms his children by lovingly telling them the stories of their births while hiding his own hopelessness, panic and dread. Phoenix keeps pace, playing Merrill as an anxious, somewhat dim, recovering screw-up with such a good heart that you almost love him for his faults. The children are equally well drawn, although they have peculiar quirks that are a little too obvious to be incidental. In fact, if the film has a single overt flaw it is that, aside from approaching a familiar story from a very unique angle, Shyamalan's filmmaking is so conventional (albeit on the leading edge of conventional) that "Signs" feels a lot like an assembly-line Event Movie until the Hess family heads down to the basement. There are quirky comic relief characters and lots of little logical loopholes that leave the smart viewer second-guessing parts of the story (especially the aliens' motives) and events reported on the news (where's the military?). The director deliberately leaves some of those questions unanswered, however, because it further isolates Graham and his family from the outside world, which in turn puts the viewer more effectively in their shoes. It is the very fact that the film is so narrowly focused that makes it so mesmerizing. Shyamalan's third-act resolution is a little bit too B-movie and his adherence to the "eerie" notion that there's no such thing as coincidence, comes across more like a screenwriting convenience than a theme of faith. The same can be said for Gibson's character being a farmer who never seems to do anything remotely related to farming. The guy gets up at 11 A.M., for crying out loud. But quibbles aside, the one thing that is definitely not a coincidence is Shyamalan's skills as a writer and director. His style may be aped from Steven Spielberg and other purveyors of Hollywood convention, but he always seems to turn those conventions on their ears and inside out.